In today’s Rulesfest we talk about the Second Rule of Sometimes: Whenever something happens, you can respond with as many cards as you like! Last week we talked about the First Rule of Sometimes, reminding you that cards don’t have any affect on you unless you must physically move your bits when they resolve. This week we want to cover what happens when cards do affect you, using the Second Rule of Sometimes: You may play any number of Sometimes cards that respond to the same game event. What the heck does that mean? On to the examples! Fiona Player: Well… I can’t prevent the Fortitude loss. But you should know, Zot, I “Instinctively aim for the head!”… twice! 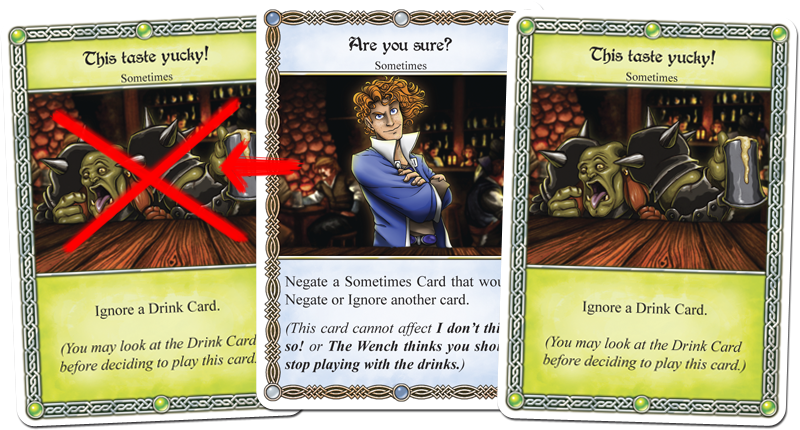 The heroes of the Red Dragon Inn are definitely brawlers, proof positive being the number of “hit-back” cards there are in their character decks! While most characters have at least one, a number of them, particularly the fighter-types, are sporting two (or more, in Bryn’s case). So here, our Fiona player is playing out both of her hit-back cards in response to Zot’s one Action card. Now, most players, even the brand new ones, are eager to effectively play out their cards in this situation – after all – everyone loves beating up their buddies! However, there are some other very exciting things you can do. Fleck: Tough luck, Dimli. Looks like you have a good drink there! A 7 Alcohol Content drinks is pretty scary, unless of course you are Dimli! A crafty dwarf knows how to hand out some killer brews to his companions, and there’s no better way to do it than by using his best drink avoidance cards: “Now this stuff is actually good! Try some!” and “You have this. I’m waiting for the good stuff!”. Did you know you could combine the effects to cause some really scary results? In this scenario, Dimli plays “Now this stuff is actually good! Try some!” first to split the drink in two, creating two 4 Alcohol Content drinks (because half of 7 rounds up to 4 and 4). When Dimli follows that up with “You have this. I’m waiting for the good stuff!” to pass his half of the drink to another player (or the same one!). And thus, through the magic of Sometimes cards, Dimli avoids taking 7 Alcohol Content and gets to cause other players to gain up to 8 Alcohol Content! Now, if Dimli wanted to get REAL rude, he could then start spiking these drinks with some Firewater! Another important thing to remember is that you don’t have to play all of your Sometimes cards in response to a game event all at once. You can technically play all of your Ignore cards at the same time, but you usually only need one since Ignoring something you are already Ignoring is kinda unnecessary. However, if your first card is Negated, there’s no reason for you to not play another! After all things are said and done, you need to know one thing: each Sometimes card defines when you can play it, but that isn’t a one-chance window. If you play a Sometimes card and it gets Negated, you’re still have the opportunity to play something else until the game progresses. Speaking of progressing, we’ve come to the end of today’s blog. 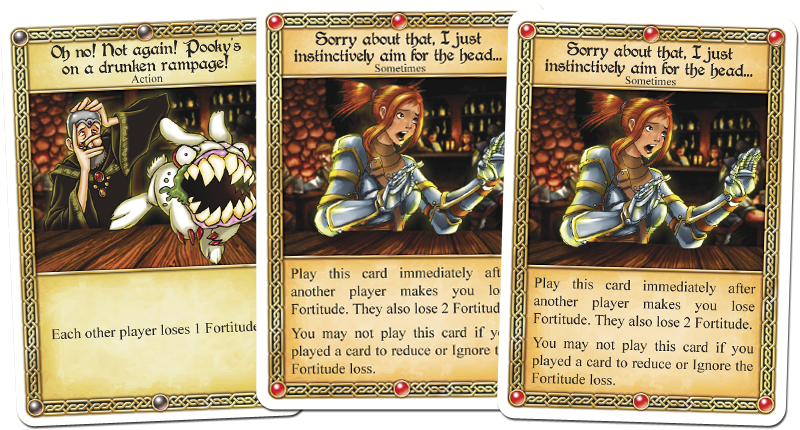 Thanks for reading, and we hope you have a blast playing Red Dragon Inn now that you are armed with a bit more knowledge about the rules!